One of the great advantages of manufactured homes is their affordability and adaptability. They can be turned into an ultimate dream home for any style. This particular homeowner dreamed of a craftsman style bungalow and she achieved that dream with a double wide transformation you won’t soon forget! 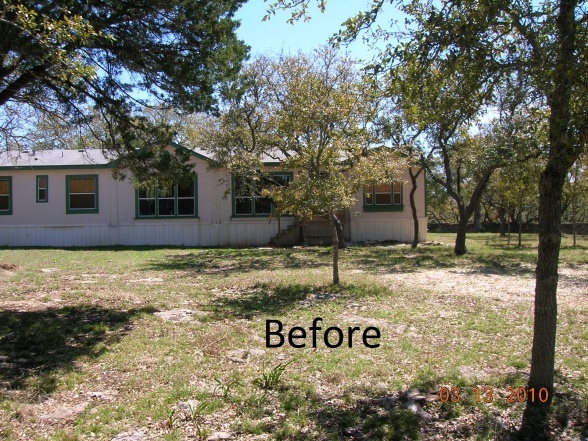 Here’s the home before the transformation took place. It’s your standard double wide, really. The large lot provides plenty of room for additional square footage though and that’s exactly what the homeowners did. 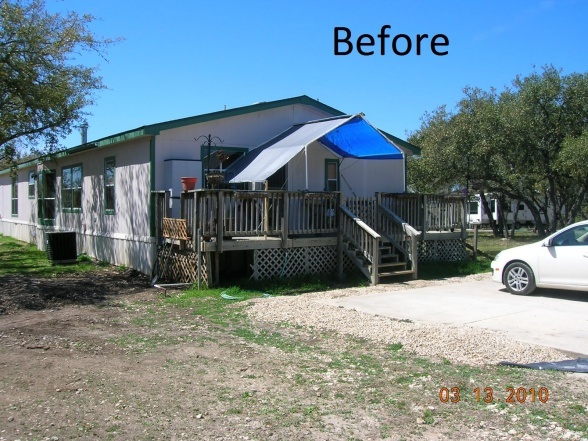 This is an amazing double wide transformation! 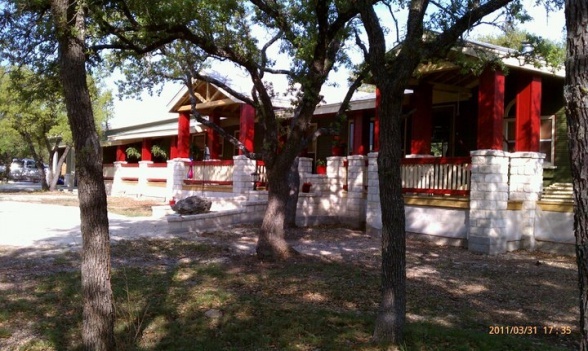 The home looks much bigger now and the outdoor space is a perfect place to relax in the cool afternoon shade. 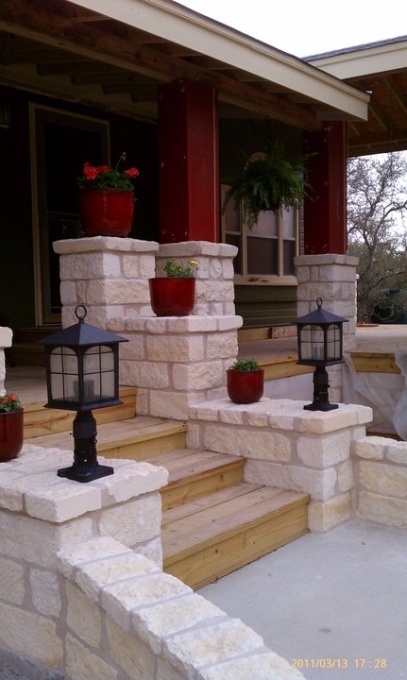 The extension of the porch with beautiful stonework makes a statement and gives the home the look of true Craftsman Style that the homeowner wanted. The deep red color definitely makes a statement, too! 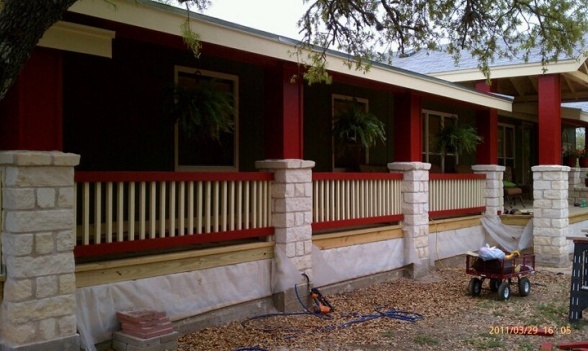 Related: 10 Great Home Exterior Designs Ides for Double Wides. 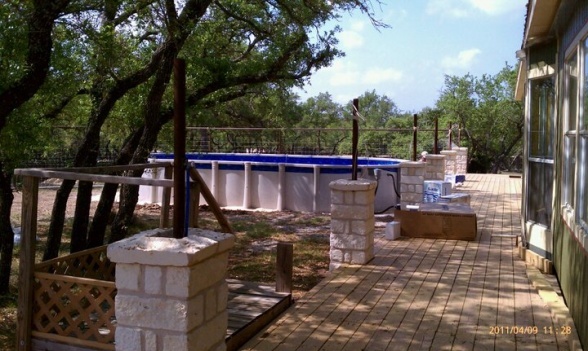 I found this home on one of my favorite sites, HGTV’s Rate My Space. 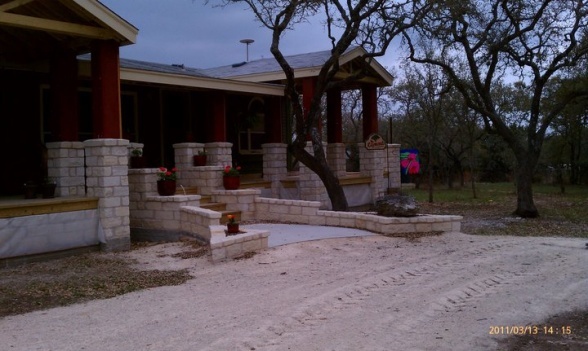 If you have time to sift through all the gorgeous homes it’s a great place to find mobile home remodels and updates. I would love to see the interior of the home and see what they have done in there. If you own this home, contact me! As always, thank you so much for reading Mobile & Manufactured Home Living. This is gorgeous…need more how to’s however, and really clear pics. Beautiful, though. I love looking at the ideas. Hope to have someday home…and collect great dream material. Thanks for staying mobile focused. I live in florida and m concerned about storm safety. Do you have any info? Hi Candy! Thanks for reading 🙂 I lived in Florida for a few years and, of course, went through a few hurricanes. My first advise is to never ride a storm out in a mobile home or any home. There’s just too many small issues that can go bad and cause an avalanche of problem. Go to a shelter. With that said, mobile homes got a very poor reputation due to the devastation caused by a couple of the bigger storms and it was very unfair how they computed the total loses (of course, if a 60,000 mobile home got 23,000 in damage it is going to be a total loss but if a stick-built home worth 199,000 got 23,000 in damage it would just be repaired. When they reported the totals of loss they made it look a lot worse than it really was and then the showed videos and photos of a bunch of mobile homes that had crashed into each other. Modern homes are made to withstand high amounts of wind (110mph) in zone 3 (Fl is in zone 3) and the homes can be driven down the road at 55-65mph but if they aren’t tied down properly, they aren’t going to withstand much of anything and unfortunately a lot more homes are wrongly tied down than correctly. They are safer than you think but they aren’t safe enough for a hurricane or tornado. The number one thing you need to concern yourself with is the tie downs. Florida’s sandy soil is soft and those tie downs have to be installed correctly to do anything. I’ve read a bit about the little scam the state has where they contracted one company out for the tie down program but the company isn’t installing the tie downs correctly and still getting paid for it. It was a politicians uncle or something and they weren’t abiding by HUD regulations. Don’t use that guy…lol…but do get your tie downs inspected. Just found your site and love it! Thanks for sharing so much helpful information! Thank you so much for reading and commenting! I think it’s so much fun to see beautiful manufactured homes and there’s really not a lot online. Well, there’s a lot out there but it’s not easy to find it. I’m glad it’s something others find helpful and interesting too. Hopefully, there’s lots more to come! Thank you! Oh this is just beautiful! I dream of building a porch like this one day. I will be starting on the interior of ours first though. 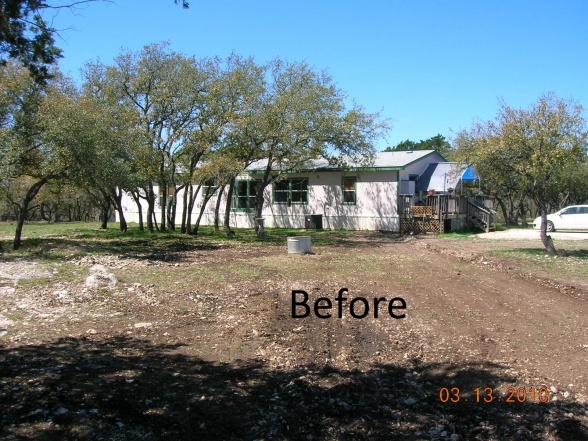 Can’t believe how much it changed that house! Wow! This is an awesome transformation. Thank you so much for sharing it with us.